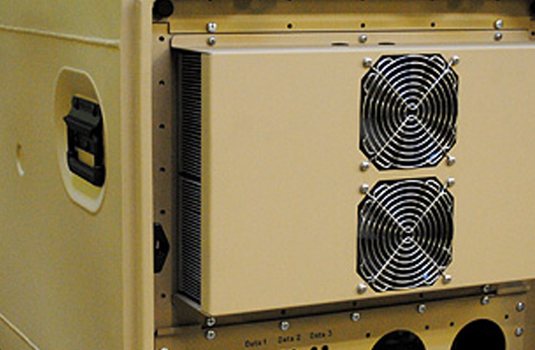 Many customers operate their valuable electronics in harsh outdoor environments. When temperature control is required, CP Cases Air Conditioned Transit Cases will complete the package. 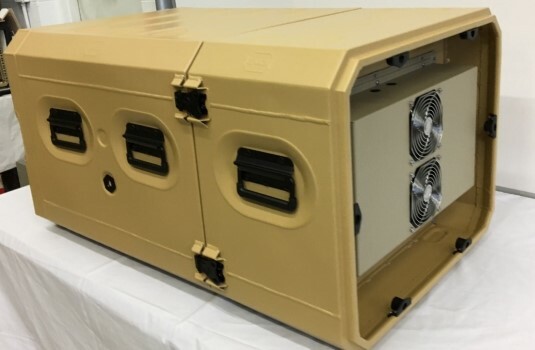 Regardless of whether your goal is to not exceed a maximum temperature within the case (cooling) or not drop below a minimum temperature (heating) or both, when proper thermal sizing calculations are conducted, chances are very good we can design a final package that will fully meet your needs. Our range of portable air conditioned racks are designed to provide a simple, effective solution to the issue of properly maintaining essential equipment within a customized 19” rack-mount system. 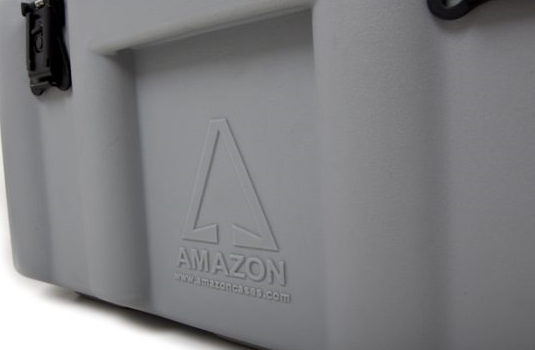 By utilizing our Amazon (rotomolded polyethylene) or ERack (welded aluminum) transit cases, combined with a reliable, solid state thermoelectric air conditioner, the final equipment configuration is a reliable, robust package that’s easy to transport and operate. 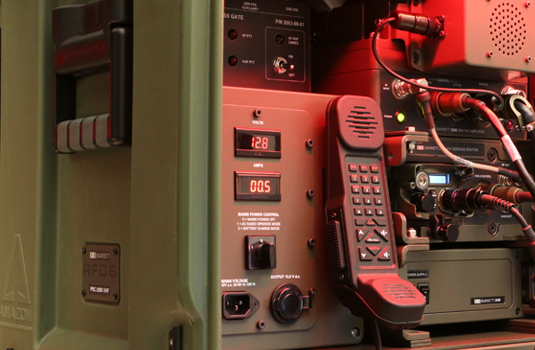 Both of these rack product lines are ideal for packaging communication, encryption, surveillance and many other types of electronic equipment. Air conditioning (and/or heating) provides the temperature control necessary to protect your sensitive components from damaging heat, as well as dirt, dust, moisture, corrosion, and most importantly – failure in the field. Both standard and customizable systems are available, with a variety of BTU cooling ranges and various AC/DC power options. Bring us your challenges and our engineers will do their best to develop an ideal solution for your application. 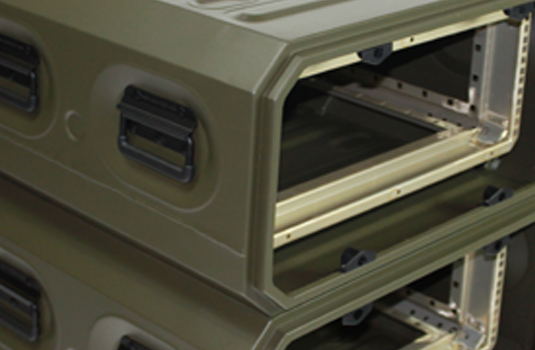 CP Cases racks (transit cases) are constructed of aluminum or rotomolded polyethylene. These high quality 19 inch racks do an excellent job protecting essential electronics from harsh weather as well as contamination from dirt, dust, sand and moisture. Often, within these airtight racks, internal heat from the electronics is trapped inside the case, which can cause overheating, sometimes with disastrous results. 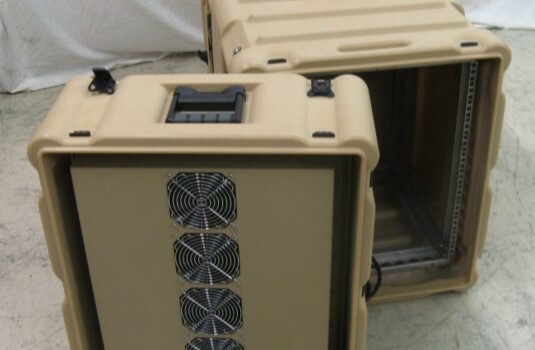 CP Cases produce a wide range of shock-mounted 19 inch electronic racks and when fitted with optional air conditioners, as well as thermal insulation, the final package provides protection from the elements. This is achieved via the use of a secondary, smaller case called a COOL-COLLAR, designed to house the air conditioner. Access and control points are obtained via one or more side-mounted optional connector panels (I/O panels).